Description: This is a presentation of a research project on the effect of classical spiritual disciplines on the spiritual and psychological well-being of participants. Eighteen persons studied and practiced thirteen different spiritual disciplines over a period of sixth months. Pretests and posttests measured the resultant change. Foundational chapters survey the literature of the disciplines and discuss the potential benefits and dangers of the spiritual practices considered. Substantial appendices contain the lessons presented on the disciplines themselves, as well as the test instruments used to measure results. A narrative relating the progress of the project from inception to completion is included. About the Contributor(s): Daniel D. Green is a professor at the Moody Graduate School in Chicago, where he teaches in the disciplines of theology, homiletics, and spiritual formation. He was a pastor for seventeen years before joining the Moody faculty in 1998. 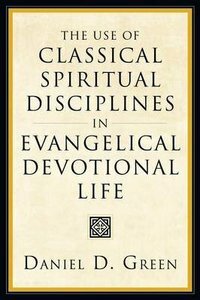 About "The Use of Classical Spiritual Disciplines in Evangelical Devotional Life"